The sudden rocking of the van woke me up. I rise from my not so pleasant position from the chair. “Where are we?” I asked myself. I looked over to Cholo and he is looking out the window, the sudden movement must have woke him up too. By now Miss Des is giving instructions to Noriel, the driver, on what to say when the security personnel questions our very early arrival. I turned on the illuminator of my watch. It is now 1:45 am. We have been traveling for two hours. As I peered into the darkness, I could see that we are going through a dirt road lined with trees. “We must be near already” I told myself. A few minutes later, the three of us are being ushered to our rooms. We walked down a cement path and down a flight of stairs. As soon as my eyes adjusted to the dim light, I saw before me; cottages on stilts across the water. We were now walking on wooden planks that leads to our cottage. I peered over the railing and see that the water is quite high. It must be high tide. The sea breeze continues to caress my skin as I walked along, making me more sleepy in each step. The alarm of my phone woke me up. It was now 5:45 Am. I turned over and grabbed it from the night stand and shut it off. I could hear the swallows darting underneath the cottage and the waves crashing upon themselves. I shifted on the bed and looked at the white curtains flying in the air. It was now breaking dawn. I slowly stood up from the bed and made my way to the toilet to pee. As soon as I parted the curtains, this is what I saw. Miss Des had some water boiling when I made my way to the kitchen. I decided to have a cup of coffee. With my steaming cup, I walked outside and sat on the terrace. Enjoying the view while the sun starts to illuminate the world. Too bad I had work today, it would have been lovely to just jump straight into the water and laze around all day . I gulped down the remaining contents of my cup. It was now a little past 6 am. I rushed to shower for I need to be on location by 7am. It is now almost 7 am. The van is winding through a dirt road surrounded by lush mangroves. I hold my makeup kit in place preventing it from toppling over. I could see fishermen starting their day. They haul their fishnets unto their backs while their dogs walk beside them. Father along the dirt road, I see other fishermen selling their catch of the day. In a second or so, I see some umbrellas and tents. We have arrived on location. I am grateful that sometimes my job brings me to places I don’t know about. We were shooting at Elizadle Beach (also called Burot Beach) which is located, approximately 2 hours and a half from Manila. Okay, 3 to 4 hours on a bad day. 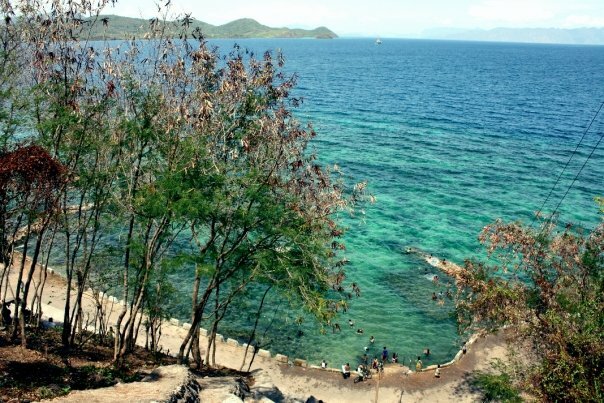 It is a private beach located in Barangay Burot, Calatagan, Batangas. Elizalde beach has been rented throughout the years for shooting purposes. I don’t really know if this beach is open to public*. I have heard that a big real estate company bought the land and will be developing it soon. It became private property and there are security personnel at the gates leading up to the beach. The production house had to ask permission to shoot there. Elizalde beach is very beautiful and underdeveloped (which I liked!). There are no cottages, there are no lights**. All you do is swim in the warm waters of the sea, lay on the sand and watch the ships go sailing by. The beach is small, maybe +/- a kilometer wide with rock out crops at both ends. It is a fairly easy walk especially when you want to find a spot along the sands to watch the sunset. I felt a little spoiled coming here for a shoot. There’s catering, there’s a portalet, and there’s a generator for electricity. The only down side was that I wasn’t able to fully enjoy the beach because I had to work. Don’t get me wrong, I am not complaining. I am thankful for the opportunity to work and to experience places like Elizalde beach. *Just as I was to publish this blog I found out that Elizalde Beach is still open to public. It costs Php 140 pesos per person to enter. ** It is best to bring your own food when going to Elizalde beach. 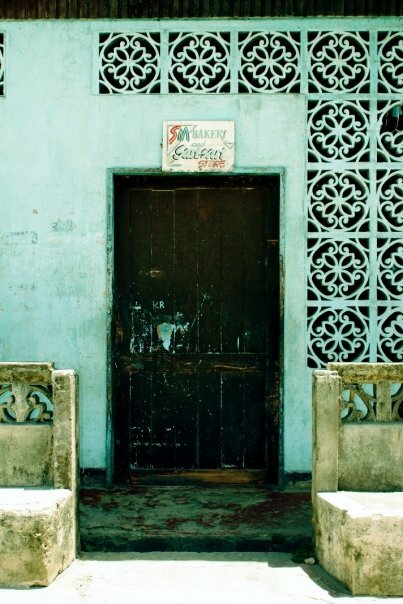 If you get hungry, there is a small sari-sari store a few meters from the beach front. for a map to Elizalde Beach click here. We were getting ready to ride on the bangka (outrigger boat), when Helena comes over. “Here’s some lunch for you guys!” she says as she hands over a package wrapped in cloth; Japanese style. We hop on the boat as she gives last-minute instructions to her boat men. I quietly on one side on the boat while Cholo sits opposite of me. My head has been heavy and my nose has been congested since we arrived in the island two days prior. “Mind over matter.” I told myself. My silence was broken when I heard the engine come to life. I look over to Cholo. “Happy Birthday and Happy Easter!” he said gleefully. I smiled to him as the banca started to ride the waves. If my memory serves me right, It would take you a little over an hour to get to Culion from Mangenguey. I’m not exactly sure now, because that was 3 years ago. But what I do remember is how beautiful it was on route. You won’t notice the passing of time because all you do is look around you. Taking in all the beauty that nature has to offer. In front of you the entire time is the blue sky and the pristine aquamarine dotted with green islands all over. I will never forget the image of coral reefs so clear through the blue-green water as I looked over the edge of the boat. One of the men stands at the bow of the bangka (see left photo). They stand and watch the water because some parts are shallower. They don’t want to risk the bangka hitting bottom. They do this every so often when we are passing between islands as a safety measure. The bangka docks in its designated area in the port of Culion and the men tells us to enjoy walking around. The municipality is quite small, we won’t get lost. As we walk around we are greeted by silence. After all, it was Easter Sunday. 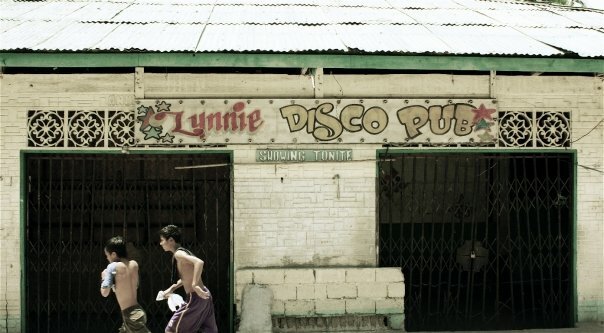 The disco pub was closed. And so was the bakery. We saw a church on top of the hill and we decided to make for it. 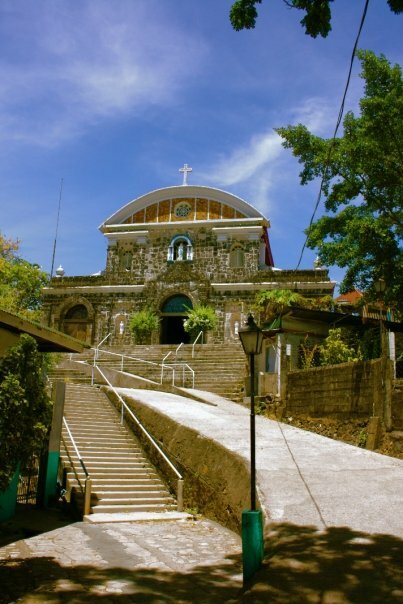 The Immaculate Conception Church was built by the Jesuits during the Spanish Colonial period of the 1880’s. When you enter the church you see a statue of the Blessed Virgin on top of the main entrance. 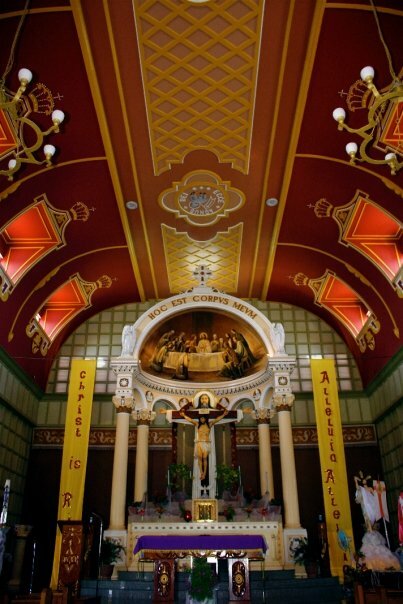 When you enter , you will see from the nave that the colors that adorn the church as red and gold. It’s quite beautiful in its simplicity. The apse depicts the last supper of Jesus Christ and His Apostles (see right). I’m not sure if the church was built on top of the old fort or if the church was built beside it, because as soon as you go around the church and walk up a flight of stairs you will find yourself atop an old tower at the highest point of the hill. You can see the sea far and wide. Though there is no beach, the water is so clear. Take note of the canon to my left. One very interesting fact we discovered about Culion is that it used to be a Leper Colony during the American Commonwealth. The details of how Culion became the world’s largest leper colony at that time (16,000 cases at its height!) 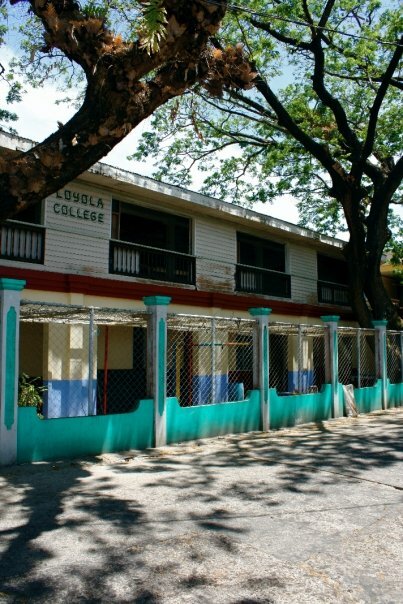 is showcased by the Culion Museum which is run by Loyola College of Culion. Visiting this museum was very enlightening because this specific part of Filipino history was unknown to me until that day. Click here to know more about the Culion Museum. You don’t have to worry when you are going about Culion because there are no lepers around. The last single remaining case in the island got cured in 1998. It was a little bit past noon and we had to get back to the banca. We can’t stay for long because we had to consider the tides. It will be too difficult to travel if we get caught during low tide. We traced back our steps to the port, bought some ice cream (Nestle Twin Popsies to be exact) from the ice cream man to beat the heat. We bought some for the boys too. I’m sure they’d want some. Then men were now maneuvering the banca with ice cream at hand. After 30 minutes of zooming past the water, the brought us to a small island with mangroves all over. Culion is not served by any major forms of transportation. It’s main connection is to ride an outrigger boat from the port of Coron in Busuanga. Busuanga is accessible via sea and air. AirPhil Express, Cebu Pacific, SEAir and Zest Air flies from manila. Click on names to be rerouted to their website. 2GO Travel (originally named SuperFerry) also goes to Busuanga from Manila on route to Puerto Princesa. Call the hotline (02) 528-7000 for schedules.